Narrative courtesy of Sue Duncan. Photograph courtesy of Larry VanWagoner. Enjoy! October 25, 2017 at 5:15 pm fourteen intrepid AVA Members left Nester Corner’s gas station in search of Sandhill Cranes. The large, long legged birds had been found many times before in an area with a farm field and adjacent ponds, but would any appear tonight? The early scouting done just an hour preceding by Larry and Sue had been totally unsuccessful. 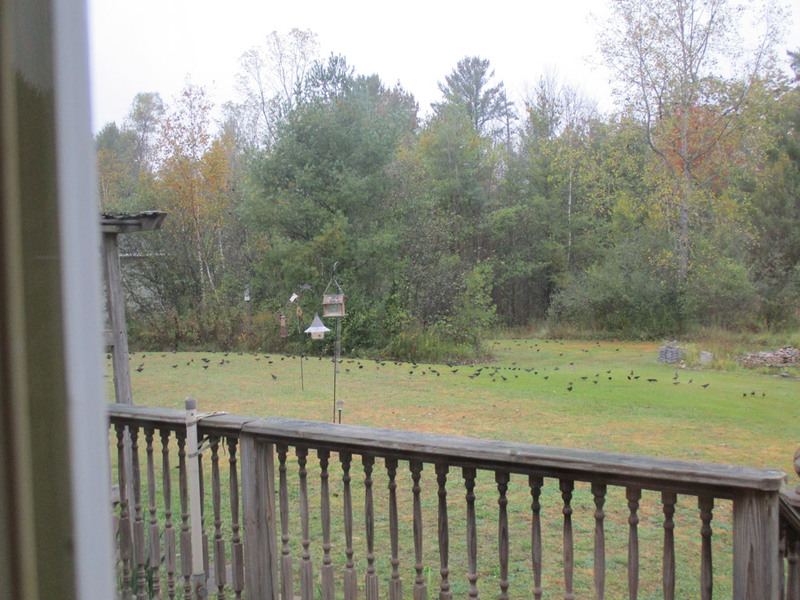 Not one bird was found feeding or flying anywhere in the vicinity. The behavior of these migrants is still puzzling to the watchers. 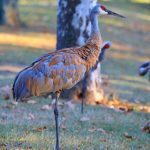 The birders arrived on site and began spotting wildlife; whitetail deer, multiple large flocks of ducks and Canada Geese, even a Bald Eagle, but no Cranes. It was cold and overcast, typically late October weather. Sunset was around 6:45, would the team be able to hold out that long? A lone crane crossed the sky! Yippee! Was it a young one that couldn’t keep up? No peeps were heard. Was it a scout for the evening flock? Why wasn’t there a couple hundred approaching? AVA 14 – Cranes 1. Finally more Cranes started to blink into view! Counting could be heard from a number of the birders. This was becoming more fun. Then just before dusk, cold and hunger got the best of the crew. With a count of 65 cranes (or so) the AVA folks gratefully got into warm cars and headed off for dinner, leaving the Cranes with their feet in the water or feeding in the field awaiting their chance to float over to find a spot to roost with the other feathery migrants. We were able to schedule a replacement program after Thunder Bay had to cancelled the November 7 meeting. 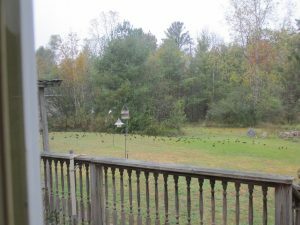 AuSable Valley Audubon will meet on Wednesday, November 8 at 1:00 p.m. at the R.J. Parks Library in Oscoda. Larry VanWagoner and Sue Duncan will present a timely program on Sandhill Cranes. Also check out the Michigan Audubon update on the status of the Resolution pending before the Natural Resources Commission to allow a fall hunting season for Sandhill Cranes and actions you can take to discourage adoption. Join us for lunch at G’s in Oscoda at 11:30 prior to the meeting on November 8! Call Sue at 989-362-2522 or email her at smcunc@charter.net by 6:00 p.m. Tuesday if you will be coming to the lunch. Due to a scheduling conflict, the presentation by Tom Funke, on November 7 has been canceled. We have not rescheduled it, so there will be no joint meeting of Thunder Bay Audubon with AuSable Valley Audubon at this time. We are sorry this late change. 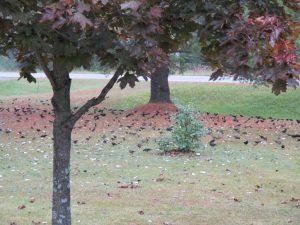 Not all fall bird groups are colorful, but variety is still there in large numbers. There were probably 200 birds in our yard this morning. They were in the front, back and side yard. They make quite a noise when they all fly at the same time! Surprise! Fall colors are here. Join your AuSable Valley Audubon friends in a walk at Lumberman’s Monument from the parking lot to the river overlook and back. Of course, you can also do the stairs or follow the trail that leads along the river… But we’re going to go as a group for short and sweet. Friday, October 13, at 11 AM we will gather in the parking lot near the visitor’s center. Bring your binoculars, as there may be birds in migration as well as our local population of Trumpeter Swans …or various ducks way down below! For those who’d like lunch afterwards we recommend the Bear’s Den on M-65, it is not far away. They have been sponsors of past birding festivals. Please let Sue know if you plan to attend, 989–362–2522 or 989–701–5471, or email sduncan@charter.net. 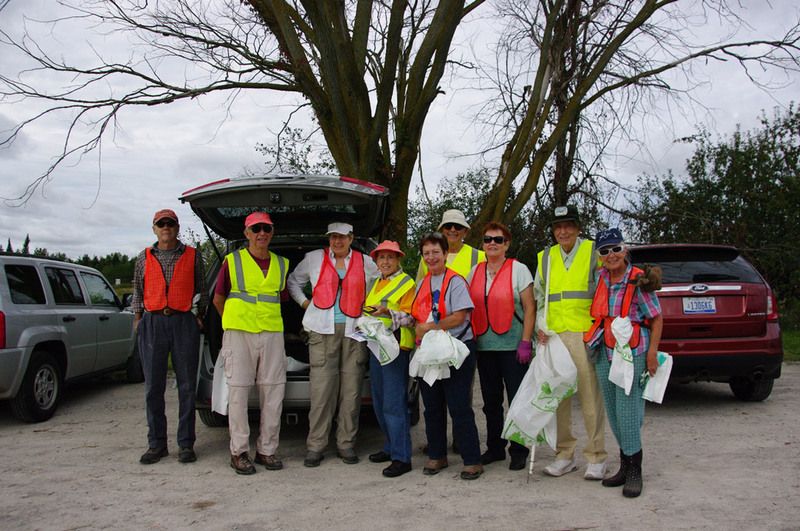 Ten of our members joined forces on Wednesday, September 27, 2017 to make the drive along M-55 a little nicer for viewers and critters. Teams of two worked in a mostly cloudy and cool breeze environment for about an hour to make a difference by picking up eleven bags of trash. Afterwards lunch was enjoyed together at Larry and Sue’s home. Newer members Doug and Marcella helped fill out the teams in the absence of some of our ‘regular’ volunteers. A good job was done by all!! Thank you! We (Sue and Larry) visited the Prescott crane site 10 days ago in the early evening. We found about 300 cranes foraging in the alfalfa field east of the roosting ponds. Past counts this early in the fall have found less than 100 birds. The Mackinaw Straits Raptor Watch group is conducting three daily/nightly surveys this fall until mid-October. 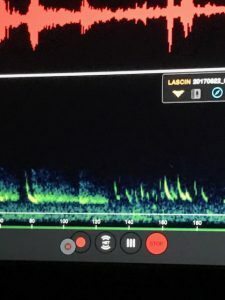 A raptor count at Pt. LaBarbie ( just west of the north approach of the Mackinaw Bridge), a waterbird count at the Straits on the beach west of Mackinaw City near McGulpin Lighthouse, and an owl banding project at Cheboygan State Park. Tuesday, October 10, 2017 at 7:00 p.m. The topic is the Great Lakes Restoration Project, an ambitious program which covers work in eight states bordering the Great Lakes. This program brings together a diverse array of habitats and conservation threats for hundreds of migratory species. The Audubon /Great Lakes office is spear heading a new approach to tackling the Great Lakes unique and diverse bird conservation challenges. Caleb will speak to Audubon’s ongoing work on landbird stopover habit, Coastal Wetland Monitoring and Restoration, Bird Friendly Communities, Wind Energy and Climate Saving Important Bird Areas (IBAs), and Black Tern conservation in the Great Lakes regions, as well as other projects. Be sure to get a copy to see all the upcoming meetings and events. 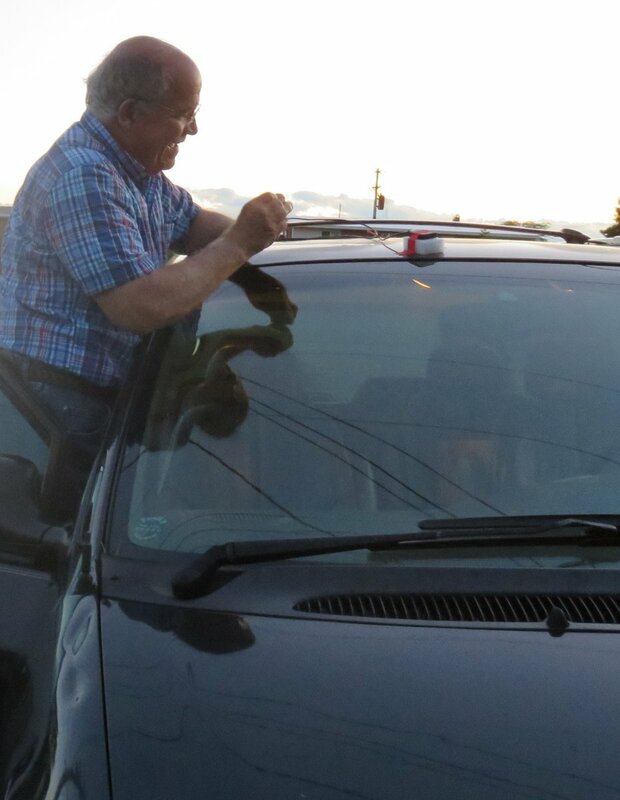 Nik Schulwitz attaching microphone to capture bat frequencies to top of car. 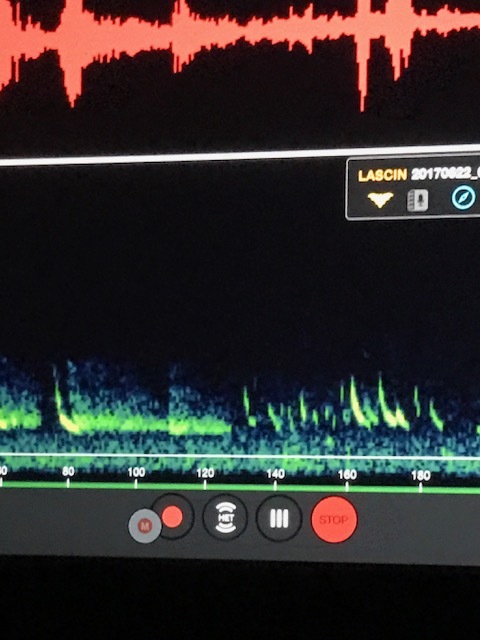 AuSable Valley Audubon was among the Michigan groups selected by the Organization for Bat Conservation to participate in the Michigan Bat Monitoring Program and to conduct an acoustic bat monitoring survey as part of its Citizen Bat League. We were sent the equipment for the survey—a microphone to attach to the top of the car, a Garmin blue-tooth device which plugged into the car cigarette holder and a pre-programmed iPad. Any bat frequencies encountered along the route were recorded on the iPad. The survey had to start one-half hour after sunset and in temperatures greater than 50 degrees. Members Larry VanWagoner, Alan Bernard and Nik Schulwitz each prepared a survey route of more than twenty miles which routes were approved by the organization. 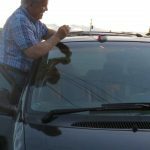 Bob Kemnitz, Jim Mortimer and Jean Howard also participated in one of the surveys. The equipment will be returned to the Organization for the analysis of the data and determination the identity of the bats encountered!